Ionosphere is an anisotropic, inhomogeneous, temporally and spatially dispersive and time-varying magnetoplasma. Due to Earth's magnetic field, the ionospheric plasma becomes anisotropic for signals especially less than 5 MHz. Due to this anisotropicity, the electromagnetic wave entering into the ionosphere splits into two modes, known as ordinary and extraordinary. These modes are orthogonal to each other and they recombine at the exit of the ionosphere. Yet, in the ionosphere, these modes travel with different wave vectors, different paths, different time delays and different frequency shifts causing the modes to suffer different amplitude, phase and polarization variations. The polarization variation is known as the Faraday Effect (or Faraday Rotation). The Faraday Rotation is proportional to the distance traveled and also proportional to the difference in wave numbers of the ordinary and extraordinary modes. The wave number is a function of the relative dielectric constant in which electron concentration is the major parameter. Thus, the computation of the polarization of the electromagnetic wave at the exit of the ionosphere is a major task which involves various parameters including the electron concentration and the Earth's magnetic field. The data communication through the ionospheric channel is highly influenced by the structure of the ionosphere. The ionosphere presents a medium which is anisotropic, inhomogeneous, time and space variant and it can also be nonlinear at times. These severe physical conditions cause distortion and dispersion of transmitted signals both in time and frequency domains. The ionospheric conditions are especially severe for high latitude and equatorial regions. Ionospheric communication channels exhibit randomly time and space variant impulse responses. Short time random variations and long time periodic variations (like day-night periodicity) cause fading and dispersion of the communication signals both in time and frequency. For the development of reliable HF communication systems, it is desirable to characterize the statistical behavior of specific ionospheric channels by investigating the joint statistics of transmitted and received signals. Also, for proper choice of transmission parameters such as bit rate and modulation waveform, certain parameters of the ionospheric channel such as channel coherence bandwidth, Doppler and multipath spread (dispersion) of signals need to be known. In order to capture the statistical structure of a specific HF channel, the correlation and covariance functions of band-pass linear time varying channel impulse responses, in delay and relative observation time, can be utilized. Power spectrum of channel correlation function in delay and Doppler is called the scattering function and it is a measure of average power output of the channel. The channel correlation function in delay can be used to obtain multipath spread of the channel. Similarly, the channel correlation function in relative observation time can be utilized to observe the coherence time of the ionospheric channel. Estimation of HF channel impulse response constitutes a first step in the computation of scattering function. Due to the various scale variations in the channel structure both in space, time and frequency, HF channel impulse response cannot be known a priori. For these situations, the modems employ channel response estimators and use these in equalization and detection algorithms, and also in the computation of scattering function. The estimations should be obtained adaptively to track the variations in the channel, and thus, improve the performance of the routines. Efficient and reliable communication via long distance HF channels requires modern modems which can process data transmitted with increased bit rates and received with lowest bit error rates possible. The time and space variant structure of HF channels cause distortion and dispersion of communication signals both in time and frequency resulting in intersymbol interference (ISI). ISI is a major degrading factor for the received signals. The quality in communication can be increased by compensating or reducing ISI by proper application of equalization algorithms in HF modems. Since HF channels are time and space variant, the channel characteristics are not known a priori. Thus, the equalizers which employ Finite Impulse Response (FIR) filters to compensate for ISI should be adaptive to adjust the tap weights according to varying channel characteristics. Most conventional adaptive channel equalization algorithms employing FIR filters make use of training sequences in adjusting tap weights. Yet, the serious multipath problems and random burst structure of noise associated with HF channels make it very difficult to utilize training sequences to update the weights of adaptive FIR filters. A possible solution to adaptive channel equalization is blind (self-recovering) equalization algorithms which do not require training sequences. Estimation of channel impulse response is an important ingredient in the design of reliable communication systems. The estimation process constitutes a first step in computation of scattering function, channel equalization, elimination of multipath, and optimum detection and identification of transmitted signals. The estimation of channel impulse response is a major challenge for noisy multipath channels that also vary both in spatial and temporal domains. The HF communication channel and underwater acoustic channel are the two examples where channel estimation has to be adaptive to time variations of the channel. In HF band, due spatial and temporal variations at various scales, the channel response is usually obtained by controlled experiments conducted for specific links and frequency intervals of interest. In these experiments, typically, a predetermined narrowband input sequence is transmitted and the variability of the channel investigated based on the observed channel output sequence. This investigation requires the adaptive estimation of the channel response where the adaptation should be fast enough to capture the short term variations in the channel response. The novel ionogram generation technique provides clean and clear layers with automatic scaling capability. Standard digital ionograms which are generated by Fast Fourier Transform or auto-regressive modeling suffer from high interference levels due to other users of the HF channel which produce artifacts and distortion, hence complicating automatic processing and information extraction. In this study, a new method is proposed to obtain high quality ionograms of the desired layer reflections and automatically extract important information such as critical frequencies. Following the standard procedures, two sets of periodograms are obtained by using rectangular and Blackman windows. These two periodograms are filtered and fused utilizing an automatic edge detection based time frequency detector. The fused ionogram provides sharp description of the layer reflections with very low sidelobe structure (ringing). The performance of this new ionogram algorithm is tested using chirp sounder data collected from an oblique midlatitude path. It is observed that the presented algorithm is highly successful in obtaining robust and sharp ionograms free of artifacts. A new algorithm is proposed for automated computation of dispersion and critical frequencies of the magnetoionic components detected on the ionogram. Since efficient signal processing algorithms are utilized, the proposed method can be implemented in real time. 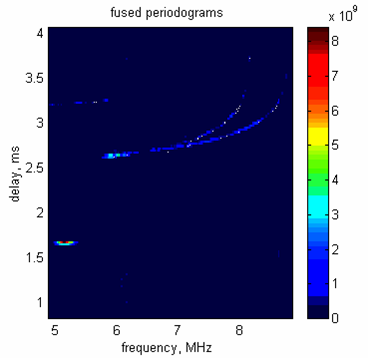 Figure 2.3 Fused periodograms of noisy ionograms. The periodogram is free of processing artifacts and noise; The main layers are very clear and distinct. Power spectrum of channel correlation function in delay and Doppler is called the scattering function and it is a measure of average power output of the channel. Scattering function provides average power of the channel as function of delay and Doppler. Since it is a widely used function in communication theory, various formulations and realizations of scattering function can be found in the literature. Alternative definitions and implementations of scattering function, which have been used among the researchers in COST 251 WP 4.1, are compared and advantages and disadvantages of each method are discussed. It is observed that both the 'textbook' definition and the experimental computations fail to identify the delay--Doppler centers of the scattering function when the amplitude, peak location of the correlator or Doppler of the layers vary frame to frame. Also the reflectivity variations of the layers can be mistaken as Doppler spreads when the layers are not actually moving. In order to overcome these problems and identify the location and speed of the layers accurately, Ambiguity function can be implemented as a Doppler filter bank. The scattering function can then be obtained separately for each frame and both the location of the paths and their speed can be determined optimally. The theoretical computation method of the scattering function allows the physical models of the ionosphere to be included in the algorithms so various models can be compared with each other. For computation of scattering function, a reliable estimation of HF channel modulation response is required. HF channel estimation can be achieved by various methods including Least Squares, Least Mean Squares, Recursive Least Squares and Kalman Filter. An alternative method for the computation of the channel modulation response directly from the received samples of the signal is proposed. 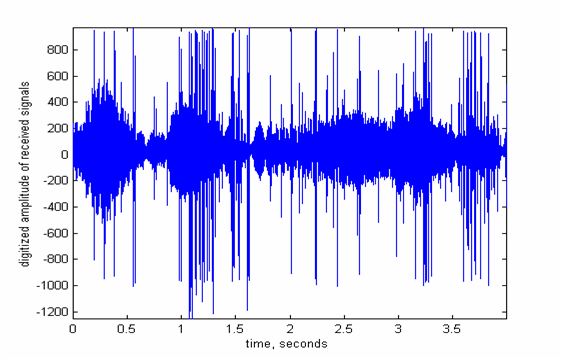 The proposed computation constrains the unknown channel impulse response to be a band-limited function of time for a fixed delay. Then, an estimate for the channel modulation response is obtained as a solution to a least squares optimization problem. After finding the optimal solution, we provide an estimator for the channel scattering function by assuming that the channel impulse response is locally stationary. Also, in the presence of no prior information on the band-limit of the channel impulse response function, we provide a practical way of determining a robust band-limit constraint. For HF channel estimation, LS and LMS algorithms have low computational complexity and easy to implement. If the channel is time-varying in not only time but also delay, the performance of these algorithms drop and they fail to track the variations in the channel. Kalman Filter and RLS algorithms are more successful in tracking variations in the channel although the computational complexity increases compared to those of LS and LMS algorithms. Kalman Filter framework is more flexible to incorporate the physical HF channel response model. Thus, with proper adaptation of system dynamics, KF algorithm is very successful in tracking the variations in the HF channel. Based on a state--space model of the narrowband HF channel response,a Kalman filter is proposed to track the channel variation in time. Robust methods are proposed for the initialization and adaptation of the Kalman filter parameters. In numerical simulations, it is observed that the proposed approach can track the channel variations. Based on developed state-space and measurement models, an adaptive Kalman filter is proposed to track the HF channel variation in time. Robust methods of initialization and adaptively adjusting the noise covariance in the system dynamics are proposed. In simulated examples under good, moderate and poor ionospheric conditions, it is observed that the adaptive Kalman filter based channel estimator provides reliable channel estimates and can track the variation of the channel in time with high accuracy. The equalization methods, both active and blind, for time varying multipath fading HF channels are reviewed. For some midlatitude channels which do not suffer from the degrading effects of severe ISI and where the training sequences can be used, active equalization with DFE or MLSE equalizers or blind equalization with Bussgang algorithms may present low cost and effective solutions. For the channels where neither training sequences nor a priori channel information can be used, blind equalization with ML method and Viterbi decoders seems to have the best performance in terms Bit Error Rates (BER) and thus coping with ISI. The computational complexity of such equalizers can be reduced by the utilization of noncausal filters in front of equalizers. A statistical analysis approach is proposed to characterize the variability of HF channel response to single-tone signals by using only the amplitude information of the received signal. By the proposed methodology, robust estimates of the time-varying mean and variance of the channel response can be obtained. For this purpose, we use sliding window statistics of the available data. On the basis of the estimated variance of the obtained results, a detailed justification of the proper window size is given. In order to obtain more reliable estimates, the data are median filtered prior to statistical analysis. A robust way of choosing the length of the median filter is presented. We applied the statistical analysis approach to a set of available data obtained from a measurement campaign between England and Turkey conducted from April 1992 to February 1993. The results of the statistical analysis confirmed the expectations of the physical behavior of the ionospheric channel. It was found that the midlatitude single-frequency channel is slowly time-varying and locally stationary in a sliding window of 22 s. Also, it was observed that the amplitude of the received signal exhibits a significant diurnal variation. In addition, during early morning hours and night hours, the channel is considerably more stable for communication purposes compared with day and early evening hours. F. Arikan ve C.B. Erol, Statistical characterization of time variability in midlatitude single tone HF channel response, Radio Science, 33(5), 1429-1443, 1998. F. Arikan, S. Salous and O. Arikan, Algorithm for high quality ionograms, Electronics Letters, 36(11), 985-987, 2000. F. Arikan, O. Arikan ve S. Salous, A new algorithm for high-quality ionogram generation and analysis, Radio Science, 37(1), 4-1 -- 4-11, 2002. F. Arikan and O. Arikan, Adaptive tracking of narrowband HF channel response, Radio Science, 38(6), 1108 -- 1116, 2003. F. Arikan, A brief review of HF channel response estimation, Journal of Electromagnetic Waves and Applications, 18(6), 837 -- 851, 2004. COST 251 IITS: Improved Quality of Ionospheric Telecommunication Systems Planning and Operation, Work Group 4.1 Sept. 1995 – May 1999. F.Arikan and O. Arikan, Review of equalization methods for HF channels, Joint COST 251/IRI Workshop and Working Group Proceedings, Kühlungsborn, Germany, COST251 -TD(97)006(PartII), 1-5 Sept. 1997. F.Arikan and O. Arikan, Computation of scattering function for HF channels, Joint COST 251/IRI Workshop and Working Group Proceedings, Kühlungsborn, Germany, COST251 -TD(97)006(PartII), 7-13 Sept. 1997. F.Arikan, Estimation of HF impulse response and computation of scattering function, Proc. of the COST 251 2. Workshop, Side, Antalya, Turkey, RAL, COST251\-TD(98)005, 273-280, May 1998. 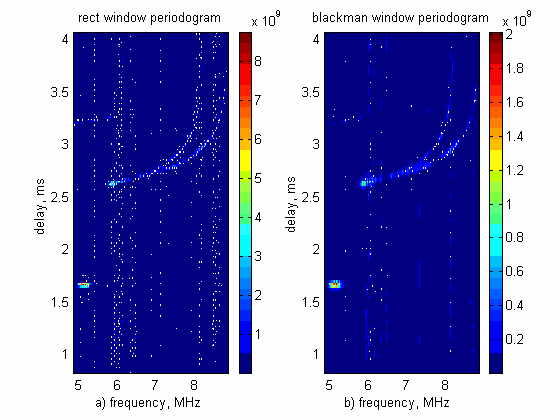 F. Arikan and O. Arikan, A practical methodology for estimation of HF channel response, Proc. of PIERS'98, Nantes, France, 962, Jul. 1998. F. Arikan, A brief review of HF channel estimators for digital modems, Proc. of Topical Workshop of COST 251, Issy--les--Moulineaux, Paris, France, 77-83, Sept. 1998. F. Arikan and C.B. Erol, `Statistical characterization of midlatitude single frequency HF channel response,' (in Turkish) Symposium of Signal Processing and Applications, (Symposium of Signal Processing and Applications), SIU'98, Kizilcahamam, Ankara, Turkey, May, 1998, 583-588. F. Arikan and O. Arikan, `A practical method for estimation of HF channel response,' (in Turkish) Symposium of Signal Processing and Applications, (Sinyal Isleme and Uygulamalari Kurultayi), SIU'98, Kizilcahamam, Ankara, Turkey, May, 1998, 125-130. F. Arikan, Comparison of scattering function computations, Proc. of 4th COST 251 Workshop, Funchal, Madeira, Portugal, 25-36 Mar. 1999. F. Arikan, O. Arikan and S. Salous, `A new algorithm for computation of digital ionograms,' Abstract Notebook of The Tenth International Symposium on Equatorial Aeronomy, ISEA-10, Antalya, Turkey, May 2000, 9-1. M.K.B. Miled and O. Arikan, Input sequence estimation and blind channel identification in HF communication, International Conference on Acoustics, Speech and Signal Processing, ICASSP2000, IEEE Publication, Istanbul, Turkey, 5-9 June 2000.